At any given time, I have at least one can of pumpkin puree in my pantry cabinet. You never know when the pumpkin mood will strike, whether it’s the middle of October, the middle of March, or the middle of August. Mike recently tagged me in a Facebook post about these cookies, and of course, they had been on my Pinterest board for some time. 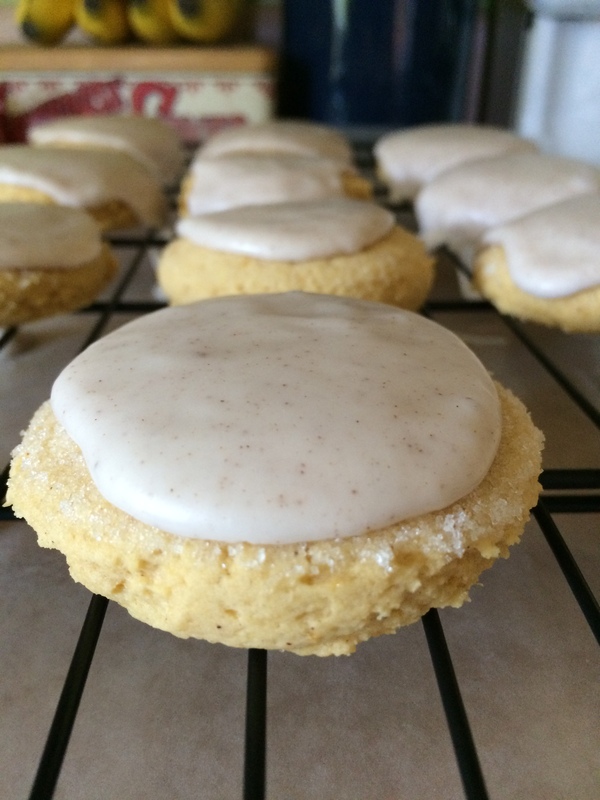 The original recipe comes from another blog, Lauren’s Latest, and the end result is a delicious combination of a soft sugar cookie and a pumpkin cookie. I adapted the recipe slightly in preparation, and because I don’t keep pumpkin pie spice on hand, I made my own – my recipe appears below. Next time, I’ll use a full teaspoon of pumpkin pie spice in the cookie dough to kick up the flavor a bit. Also, I increased the quantities in the glaze recipe, because the original recipe didn’t produce enough glaze for my batch of 39 cookies. Make pumpkin pie spice: in a small bowl combine cinnamon, ginger, allspice, and nutmeg. Stir together until very well-combined. Make cookie dough: in a large bowl, combine flour, baking soda, cream of tartar, salt, and pumpkin pie spice; set aside. In a mixing bowl, beat butter, vegetable oil, pumpkin puree, granulated sugar, powdered sugar, vanilla, and eggs until smooth; some small lumps of butter will remain, and that’s fine. Gradually add flour mixture, about 1 cup at a time, beating well between each addition and scraping the sides of your bowl frequently. Using a 2-inch cookie scoop, scoop dough onto baking sheets. Spray the bottom of a glass with cookie spray, dip bottom into sugar, and flatten cookies to about 1/2 inch thickness. You’ll need to re-coat your glass with sugar between each cookie. Bake for 9 minutes, until edges are set and tops are just beginning to turn golden. Cool on baking sheets for 3 minutes, then remove to a wire rack to glaze. Make your glaze while your first batch is baking: in a large bowl, combine powdered sugar and pumpkin pie spice, mixing well to combine. Add water, 1 tablespoon at a time, until your mixture reaches a thick glaze consistency. Using a teaspoon from your measuring spoons, scoop glaze onto each cookie, allowing to drip over edges. Allow to cool completely before serving. Store cookies at room temperature in an airtight container between sheets of waxed paper.